Nordstrom Anniversary Sale – Review of What I Bought! The Nordstrom Anniversary Sale is open to the public today!! If you’ve been shopping the sale like I have, you know this year there are so many amazing deals! I am hoping to pick up a few more goodies today as they restock the sale for the public! Today I am sharing some of the pieces I picked up during early access. I am still waiting on a few packages to arrive, but hope to update this with pictures when I get them (hopefully a few arrive later today)! You can also follow me on snapchat (ashley_tgs), as I’ve been sharing some of my picks and sizing info on there! Don’t forget to check out some of my favorite sale picks here and here! Bell Sleeve Dress (Now: $32 // After Sale: $48 ): One of my favorite sale picks! This dress comes in 10 colors and is SO cute on! Wear it with sandals for the summer time or pair it with boots in the colder months! I found it to run slightly large, so ordered an XS. Over the Knee Boots (Now: $120 // After Sale: $180 ): These boots are actually from last year, but found these almost identical option on sale! At $120 these are a steal! The black are in my cart!! 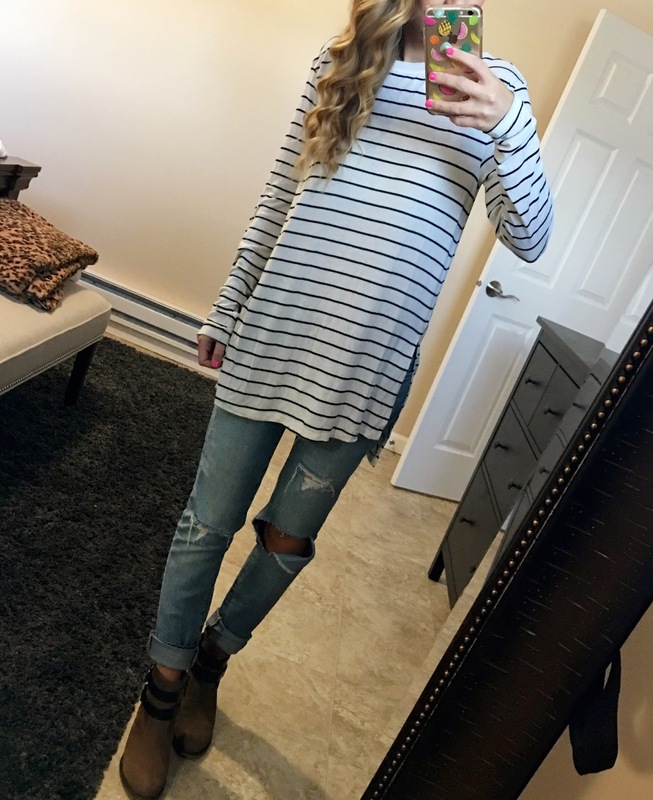 Striped Tee (Now: $16 // After Sale: $24): This tee is SO good! Once I tried it on, I automatically went and put a few more colors in my cart. This is one of those basics that can be worn a million ways and it’s so comfortable! This does run large, but I stuck with a small because I wanted that oversized fit! Jeans (Now: $59 // After Sale: $88): These are one of my favorite brands! I ordered them immediately and they are one of my favorite purchases from the sale! I did order a size up because I wanted these ones to be a bit baggier. Shoes (Now: $43 // After Sale: $65): I wear these with EVERYTHING, and when I saw the even cuter option that are a part of the sale, I almost ordered them! These are so easy to wear and I love pairing them with denim or dresses! Long Sleeve Tee (Now: $18 // After Sale: $28): Another staple! This is so comfortable and can be styled a million ways! This does run big and I’m slightly wishing I would have gone with an XS, but don’t mind the oversized fit of the small! Buckle Booties (Now: $100 // After Sale: $150 ): My FAVORITE booties from last year are back and in more colors! These are so comfortable and a fall essential! Top (Now: $25 // After Sale: $38 ): I am hoping to see this top restocked in all colors and sizes today, because I definitely want it in a few more colors! It has the most flattering fit and is TTS (wearing a small). The best part though? The laced up back (no worries girls, it doesn’t show your bra)! Cozy Cardigan (Now: $32 // After Sale: $48): By far my favorite piece from the sale, this cardigan is amazing! I already ordered it in a few different colors, it’s that good! I love a good cardigan, especially when it comes to my work wardrobe. A cozy cardi is perfect for chilly winter days in a cold classroom and can transition some of my warmer weather dresses and tees for the colder months! This one does run large, so I am wearing an XS. 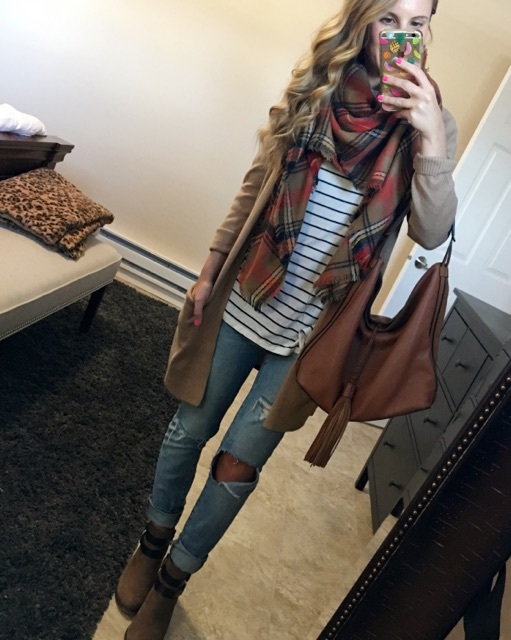 Plaid Scarf (Now: $19 // After Sale: $30 ): This scarf was my favorite last fall! I was so excited to see they brought it back for the sale because it is a fall essential! I wore mine a ton last year (as seen here and here), and found it so easy to style (especially with stripes and cognac accessories)! Hobo Bag (Now: $197 // After Sale:$295 ): While this exact bag (HERE) isn’t on sale, this super similar style is and in SUEDE. Anybody else obsessed with suede for fall?? Dress (Now: // After Sale: ): This dress is the PERFECT dress to wear now and layer up later! You can get a better look of it in the picture below! It’s coming off more white in these photos but it really is the most interesting light greyish color…it’s very hard to even pinpoint what color it is, but I love it! Bag: Now this bag is not part of the sale, but it is currently ON sale for $32..confusing I know. This reversible tote is a must have! I am going to pick it up in another color to be my school bag this year! Bag: Now this bag isn’t on sale, but you can find a few suede Rebecca Minkoff’s in this color on sale now! This color really is even better in person! I have this one in grey and LOVE the size and this one is on my wish list!! Wedding Guest Ready Under $100 and a GIVEAWAY! Love everything you got! The NSale is perfect for shopping for fall clothes. I love, love, love the gray long sleeve top and the basic tee! Total grabs for me! I've already purchased a few pieces from the NSale and I am so tempted to go crazy and splurge on more! As always your choices are so cute! You got so many great pieces! If the Nordstrom Sale was a competition, you definitely would've gotten first place! Love seeing what you got! Can't wait to go shopping today!! I am so happy I went yesterday and made my last stock up on everything! So many cute things! So many cute options here! So many great picks, I love that scarf I was actually just look at it this morning! Ooh i LOVE everything you got but that first outfit is seriously goals! Love your buys! 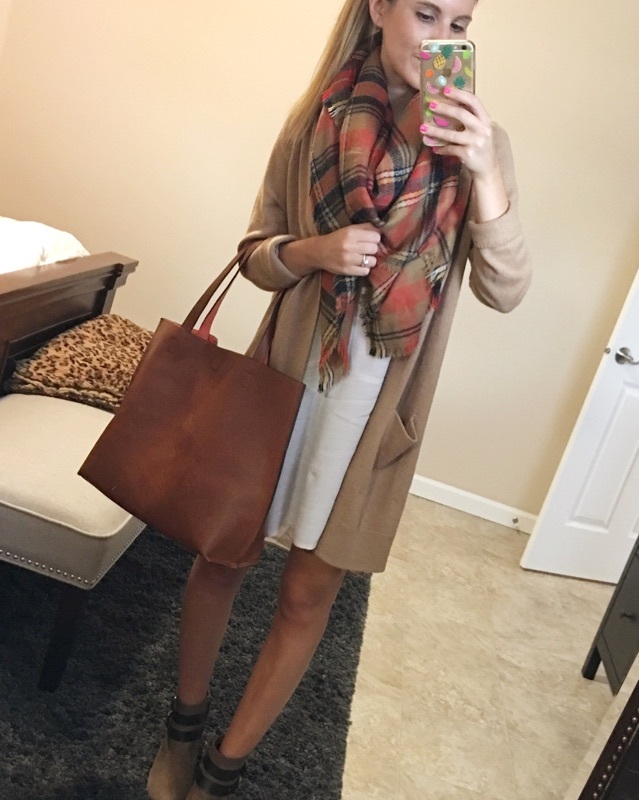 So many perfect items for fall! The NSALE is just TOO good this year! Omg you got some seriously amazing stuff. I've never shopped the Nordstrom sale before but I feel like I need to start after seeing what you got…The jeans are so cute and I love both the striped and gray tops, and the booties! Seriously awesome finds girl! Girl those distresses jeans are beyond cute. AWH girl your style is stunning!!!! LOVE this post. Loving all of these picks!! Such a great time to pick up basics! You got so many cute things! I really wish I would've gotten that bell sleeve dress and some booties! I love summer and don't want it to end, but you just got me excited for fall with all these clothes! Very happy because presented with the information that is so very helpful thanks. Apa Obat Radang Gusis Terbaik?